We’ve all been there before. It starts with one or two skipped workouts, maybe due to illness, or a big work deadline, or a bout of mid-winter blues. Then, you start making more frequent excuses: I’m too tired today or I’ll do an extra tough workout tomorrow. Pretty soon, your gym shoes are collecting dust and your yoga pants are relegated to Netflix binge sessions. When you’re in the middle of a workout slump, it’s hard to find the motivation to get back into a regular exercise routine again. You know that you’ll have lost stamina, strength, and agility. And it’s really hard to kill bad habits, whether you’re stuck in a rut of sleeping in (instead of getting up for early morning yoga), hitting up the nearest fast food place during your lunch break (instead of taking a walk), or spending your evening flipping through the sports channels (instead of getting in a late night gym session). So, if you’re feeling guilty, discouraged, or frustrated about your current workout slump, you’re in the right place. You know it’s time for a change, and we’re here to help. 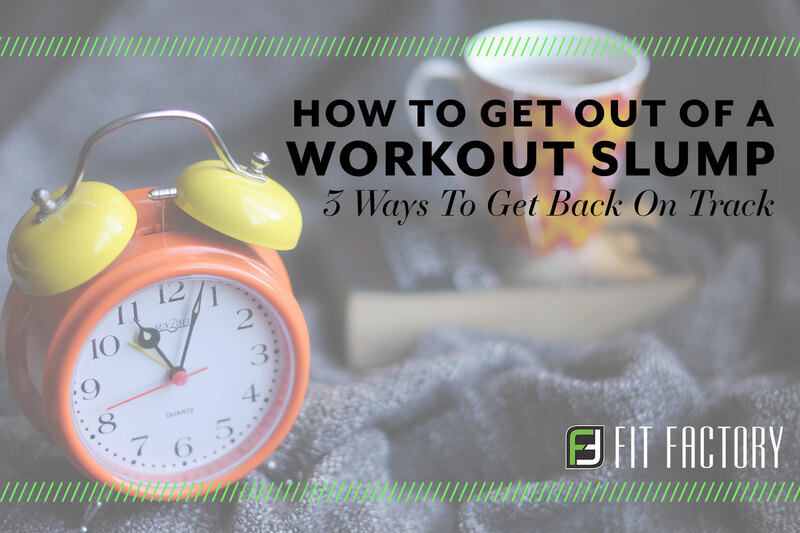 Here are a few of our tried-and-true tactics for getting out of a workout slump and back on track. Don’t try to change all of your bad habits at once. And don’t try to go from zero workouts a week to daily, ninety-minute workout sessions. It’s not gonna happen. Instead of putting a ton of pressure on yourself (and setting yourself up for failure), start slow. Take a walk every evening. Trade one TV show for one workout every week. Start setting your alarm for fifteen minutes earlier every morning so that you can do a quick yoga flow on your bedroom floor. If you start with small, realistic changes, you’ll be back at it in no time. When you’ve allowed unhealthy patterns to creep back into your life, it’s easy to adopt a really negative attitude. But being hard on yourself isn’t going to fix anything! If you find yourself thinking things like: I’m such a loser or I'll never be in shape or I’ll just fail again, it’s time to choose a new mindset. Instead of focusing on guilt or shame, start speaking from a place of positivity, confidence, and self-love. Remind yourself that it’s safe to start again, that you’re awesome for choosing a healthier path, and that you’re resilient for finding the strength to begin anew. When you’re just beginning to add workouts back into your schedule, make it as easy as possible to follow through. Pay attention to your calendar, your habits, and your personality, and make smart choices that will make it easier for you to get in your daily sweat session (and harder for you to make excuses). Do you have a really big work presentation on Monday afternoon? Don’t schedule a two-hour personal training session for that morning—you’ll probably flake out. Instead, plan to complete a fifteen-minute YouTube workout at home. Will you be out of town for the weekend? Book a hotel with a gym, pack your tennis shoes and a few workout outfits, and bring your headphones so that you can listen to upbeat music while running on the treadmill or lifting weights. Do you have trouble completing anything that isn’t on your official calendar? Schedule a weekly running date with an active friend, plan to attend a weekend kickboxing class with your partner, or book a personal training session for a midweek workout. Getting those things booked in advance will make it easier for you to follow through and stay consistent. Finally, remember that your worth and your self-esteem don’t have to be defined by your weight, your fitness level, or the number of times you workout every week. Instead of feeling guilty for all of the times you don’t make it into the gym, practice gratitude for your incredible body and celebrate every time that you choose to treat it well. Those little moments will add up...and baby steps are always the secret to big change.